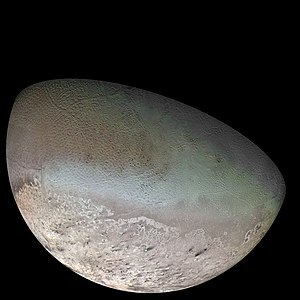 ভয়েজার ২ photomosaic of Triton's sub-Neptunian hemisphere. The bright, slightly pinkish, south polar cap at bottom is composed of nitrogen and methane ice and is streaked by dust deposits left by nitrogen gas geysers. The mostly darker region above it includes Triton's "cantaloupe terrain" and cryovolcanic and tectonic features. Near the lower right limb are several dark maculae ("strange spots").